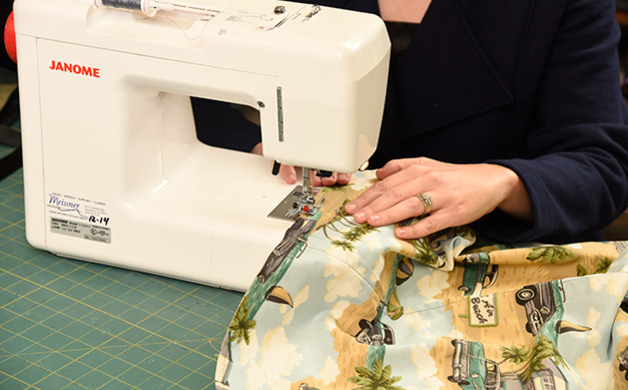 In 2002, Darlene Aniasco, co-founder of the newly formed Placerville Chapter of the American Sewing Guild (ASG), decided to place a strong focus on charity to experience the most growth—and she was right in doing so. The Placerville Chapter now has 11 neighborhood groups located from Folsom to Lake Tahoe, and in Jackson and Amador County. Each group meets once a month to share their passion, swap sewing tips and work on new projects; anyone with a passion for sewing and a willingness to learn is welcome to join. All of the groups make charitable items on occasion, but two focus entirely on creating heartfelt, handmade items for people in need. Working with a variety of organizations, ASG members have donated thousands of jackets, hats, scarves, teddy bears, pillows and quilts. Many of the group members are talented artists whose skills are not tested by the charitable items they create. “We’re very lucky because we have a large number of nationally known fiber artists who are members, so we can learn from them and also teach each other,” explains President Bobbi Bullard, herself a prominent embroidery author and educator. Fiber art refers to gallery-quality pieces or wearable art—anything that puts beauty over function. “It is really amazing how much we can get done,” says Hopkins. “The people who come to the meetings are really pretty dedicated to community service...committed to making life better for other people…” Guild members have gotten so enterprising in their charitable efforts that they even save the scraps—turning the bits of fabric into stuffing for pet beds that they donate to groups like Fat Kitty City and Tibetan Terrier Rescue. Non-members are encouraged to attend the upcoming two-day event in April, featuring speaker Nancy Nix Rice, a wardrobe consultant coming in to talk style with the members (many of whom make their own clothes). A lecture and luncheon will take place in Jackson on April 15, a workshop on April 16.